Delivering East-West dominance involves finding the ‘edge’. But how is a strategy-at-the-edge to be delivered? How are services at the edge to be supported if they must be responsive to the customer’s context-of-use? This represents a challenge to the architecture of an enterprise that questions the ideological basis of the enterprise itself. In the following diagram, two organisations are shown, each with a reporting hierarchy under which a number of functional units operate, providing particular types of treatment. This accountability to the ‘North’ is exercised in terms of the costs incurred by each unit (typically over the course of a year) in the provision of its services. These costs are influenced by the economies of scale and scope that each unit can generate, given the way each unit provides its services. 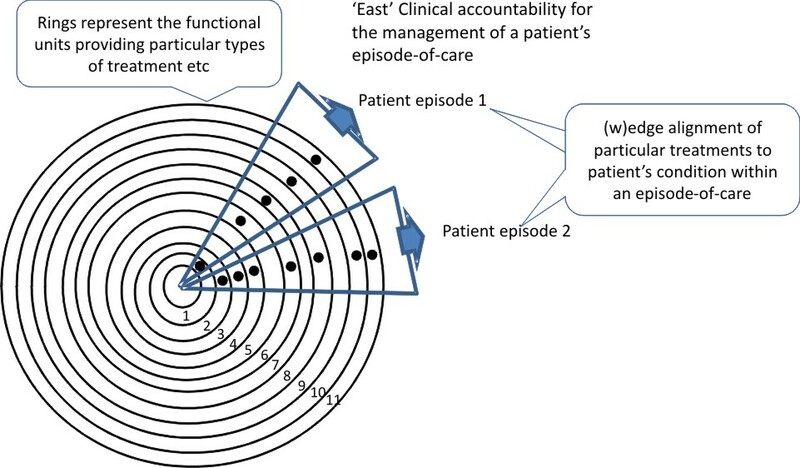 To the ‘East’, two patient episodes of care are identified, each episode demanding a particular combination of treatments. This combination is represented by the horizontal blue line, and for the episode to be effective, the constituent services have to be aligned to the particular patient situation. 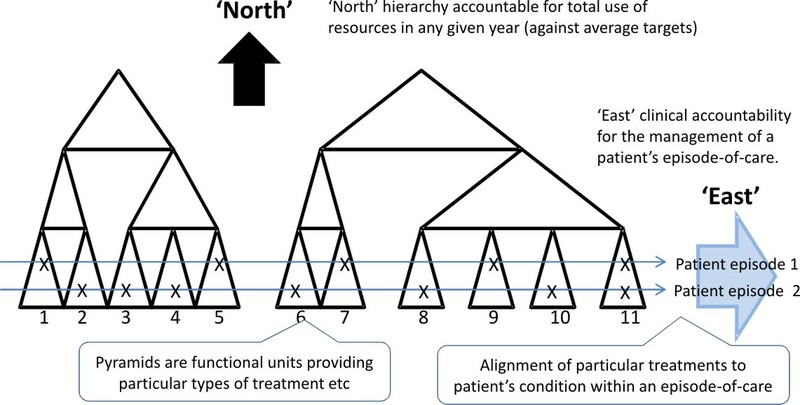 Accountability to the ‘East’ would involve holding the clinician responsible for this alignment, the costs of which would depend on the economies of alignment possible in the way treatments from multiple organisations can be aligned. Each episode-of-care is represented now by a wedge, representing the particular alignment of treatments needed for that patient’s condition. The economies of scale and scope depend on the way functional units (rings) can deliver services into multiple wedges, while the organisation of the wedges determining the economies of alignment possible. with East-West dominance, the tension between the Northern economics of scale & scope and the Eastern economics of alignment have to be managed dynamically, and therefore explicitly. The rings need not belong to a single organisation, so that each (w)edge becomes a collaboration. The architectural challenge of East-West dominance is therefore how to manage the tension between wedges and rings dynamically. A first step towards managing this tension is through identifying the multi-sided matrix in terms of which it can be expressed. This ‘multi-sided matrix’ sits in the middle of a stratified set of relations linking underlying behaviors all the way through to the ultimate contexts-of-use in which demands arise, and is the key link between supply-side and demand-side ‘logics’ of supply and demand.